Rasoul Najafian was born in 1951 in Tehran. He learned the theory and practice of music with Esmaeil Mehrtash and studied acting and directing for four years with Mostafa Oskouei. In 1974, his short film Papoli Jan won the first prize of the ABU Asian Film Festival. He has produced, directed, and acted in several projects for the stage and television. His work in cinema includes assistant director in Saeid Ebrahimifar’s critically acclaimed movie Fire and Reed and Shahriar Parsipour’s Image of Love, a fictional biography of the fathers of Coffeehouse Painting; he also composed the score of the movie, for which he was nominated for the best music score in the Fajr Film Festival. Over the last twenty years, Najafian has focused on the history of Iranian performative traditions such as shahnameh-khani, parde-khani, and naqqali. 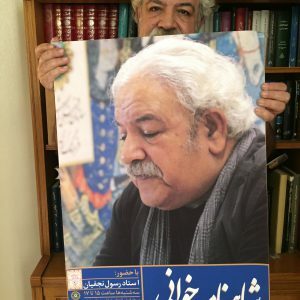 He has produced several stories of the Persian epic, Shahnameh, for stage adaptations inspired by coffeehouse painting and regional Iranian music.